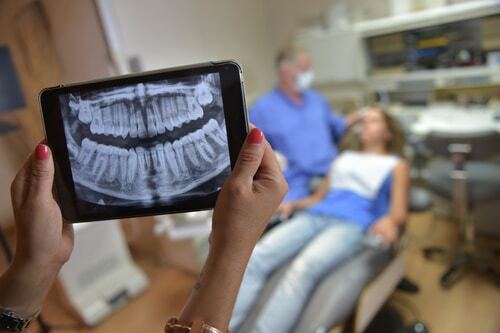 Dental x-rays are an essential diagnostic tool at dhealth Dentistry. We have invested in the safest technology available, and our x-rays emit incredibly low and entirely safe levels of radiation. X-rays allow us to find problems that can’t be identified with the naked eye. For example, we can see cavities or decay between the teeth or under pre-existing fillings and prevent it from becoming worse thus requiring invasive and expensive treatments. Why Visit Us For Dental X-Rays? Your exposure to radiation is significantly lowered. Having two intraoral radiographs taken is likened to be walking under the sun for 30 minutes. This is because there is cosmic radiation even just by sunbathing! X-rays are really nothing to fear. In fact, you are exposed to far more radiation in your day to day life than you are during an x-ray with us. They really are a necessary diagnostic tool. However, despite how safe they are, we do only recommend them when absolutely required. If you are concerned about having an x-ray taken, or subjecting your child to an x-ray, please talk to one of our friendly staff members. We also have lead aprons available which can minimise radiation in targeted areas also. We’ll be happy to answer any questions you have and suggest further options if required.